Specialist William Lynn, a nineteen-year-old Texas native. Amid clamoring patriots sporting flag pins on their lapels and Support Our Troops bumper stickers on their cars, the Bravos are thrust into the company of the Cowboys' hard-nosed businessman/owner and his coterie of wealthy colleagues; a luscious born-again Cowboys cheerleader; a veteran Hollywood producer; and supersized pro players eager for a vicarious taste of war. Among these faces Billy sees those of his family—his worried sisters and broken father—and Shroom, the philosophical sergeant who opened Billy's mind and died in his arms at Al-Ansakar. Over the course of this day, Billy will begin to understand difficult truths about himself, his country, his struggling family, and his brothers-in-arms—soldiers both dead and alive. In the final few hours before returning to Iraq, Billy will drink and brawl, yearn for home and mourn those missing, face a heart-wrenching decision, and discover pure love and a bitter wisdom far beyond his years. 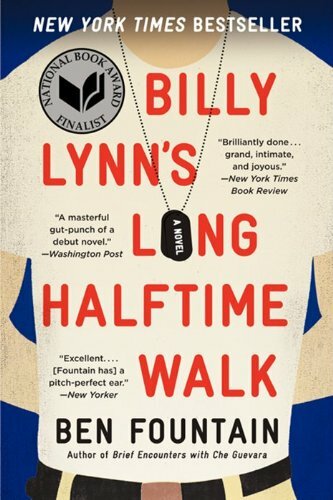 Poignant, riotously funny, and exquisitely heartbreaking, Billy Lynn's Long Halftime Walk is a devastating portrait of our time, a searing and powerful novel that cements Ben Fountain's reputation as one of the finest writers of his generation.